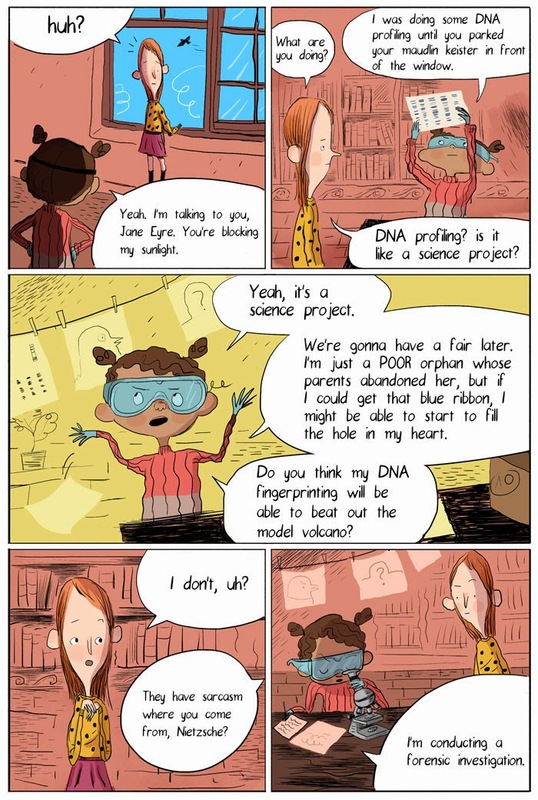 A young girl is orphaned, and finds herself placed at a very strange home where the other kids are involved in solving crimes in a webcomic that's extremely engaging, a bit surreal, and a lot of fun to read. I don't catch up on Study Group nearly as much as I should, and so I've been taking one night a week to read over some of the amazing comics that are there I haven't read yet. It's been a highlight of my reading week (no surprise there) and of course, given the fact that Zack Soto, Farel Dalrymple, Box Brown, and Julia Gfrorer are part of an amazing set of contributors to Studygroup, it's to my delight that I'm digging what I find. So when I say that The Short Con is one of the best things I've read on Studygroup, that's no small feat, given the friendly competition. As I said in the opening sentence, it's just a real joy to read. Toms and Sennwald don't try to do too much with the premise. They just roll with it, filling the pages with lots of jokes, ridiculous situations, and a premise that's begging for more stories in the world. We open with the young girl, Mary Branwell, who is listing how much she hates everything around her, almost stereotypically. That's when the co-protagonist, Pops, shows up to burst her self-loathing balloon by informing her others are trying to work. Pops, also a girl at the orphanage, fashions herself a detective. Acidly sarcastic, Pops keeps referring to Mary by just about anything that's not her name, from Nietzsche to Jackie Joyner, depending on what Mary is doing. Soon, the two are paired up by a Nun playing the role of crusty police captain, who tells Pops not to investigate the death of Mary's parents. Three guesses what happens next, and the first two don't count. As Mary and Pop get deeper into trouble, the plot gets even sillier, as the two find out that a scorned member of Mary's family is responsible for her troubles, but it's done in such a way that the seriousness doesn't bring down the room, because by that point we're long since passed into the area of high farce and impossible situations, which started on page one when Mary was hating on poor pigeons and Pop explains that landlords seed poor neighborhoods with vampires in order to take over the real estate. Yeah, it's that kind of comic. One that wears its silliness on its sleeve, and says "If you like that one, wait till you see what we do next!" along with "And if you don't like that one, probably best to click away now." Naturally, I am a part of the former group. Sure, I love drama and dark tales of ambiguity as much as the next reader, but when I encounter a work that's just about the pure joy of imaging improbable stuff and linking it together with clever dialogue and brisk pacing, I make sure others take note, too. It helps a ton that Aleks Sennwald understands that a story like this needs broad visuals that worry very little about realism. Her lines are squiggly, with arms flowing loosely, ala Adventure Time. 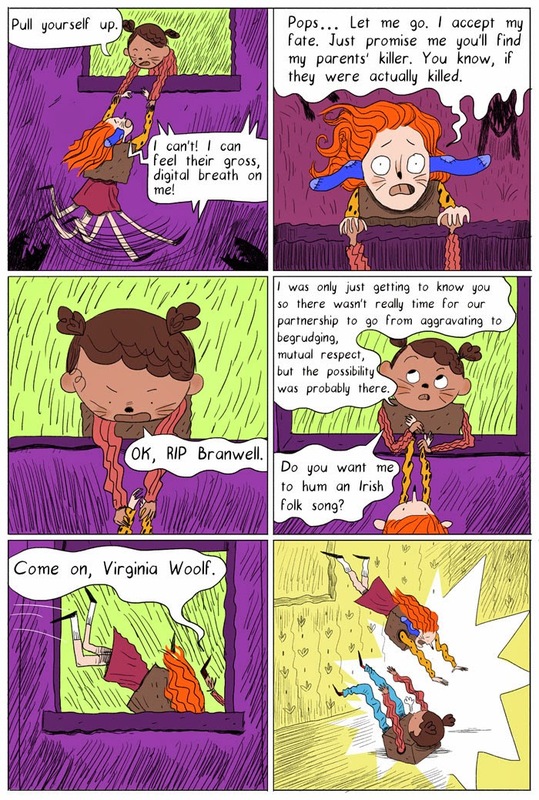 It reminds me a bit of Bad Machinery as well in terms of how the human characters are drawn and positioned, with just a bit of a Victorian look while still being very modern. Sennwald frames each page very well, emphasizing movement, and some of the touches (like having what's showing on a character's computer screen reflected in her glasses) are simply brilliant. There's quite a bit of verbal banter, and one of the few issues I did have is that at times I felt like Toms got "Chris Claremont Disease" and crowded Sennwald out a bit. I loved the dialogue, but there were a few times when I wanted to see more of what was going on, and the word balloons, which are nice, large, and legible, got in the way a bit. Still, when let loose, Sennwald really shines. Pops jumps out at the reader, being larger than life and never letting anything get in her way. We see this in how she's portrayed, never looking like she's been defeated, even when the odds are against her. Her constant use of disguise is a lot of fun, too, especially since it means that Pop's always doing something, even when having a longer discussion. Another thing I really dug, visually, was the use of recurring images, such as when Pop twirls in circles to think or she stares while others are taking action. Those moments built her character without using dialogue to do it, though we get that, too. Mary's more the straight man here, but Toms' handling of her being drug around by Pops works well, often showing her awkwardly flung into the situation, like it or not. Oh, and props for a Yellow Wallpaper reference. Nice touch. 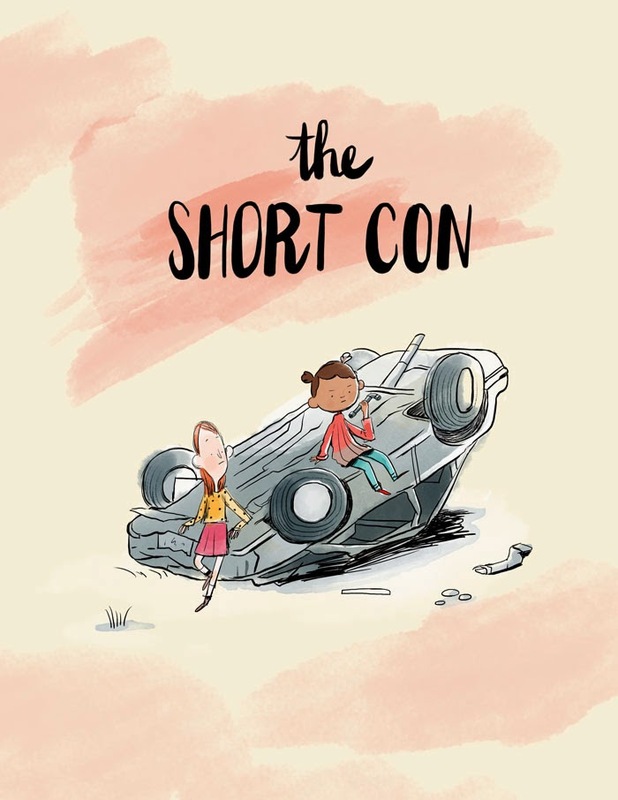 The Short Con is a great webcomic that's hip without being overly referential (the idea that one of their housemates writes fan fiction about Pops is cute), striking that careful balance that something like Lumberjanes does so well, where the comic uses elements that young and older fans alike can enjoy, but doesn't fall into pandering tropes. Comics can sometimes be there to be fun, and The Short Con is no deception. It's a romp you'll want to see more of when you reach the end. I know I did. You can read The Short Con here.